A pseudo-Messiah and wonder-worker, who lived at the end of the thirteenth century. 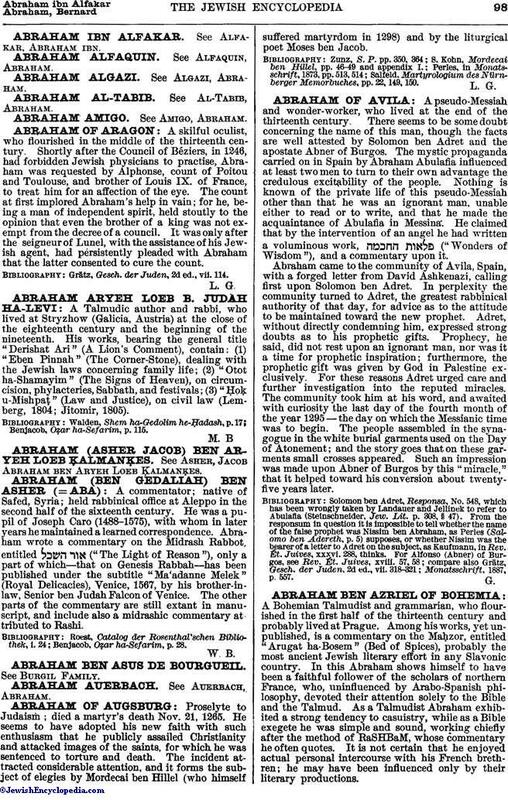 There seems to be some doubt concerning the name of this man, though the facts are well attested by Solomon ben Adret and the apostate Abner of Burgos. The mystic propaganda carried on in Spain by Abraham Abulafia influenced at least two men to turn to their own advantage the credulous excitability of the people. Nothing is known of the private life of this pseudo-Messiah other than that he was an ignorant man, unable either to read or to write, and that he made the acquaintance of Abulafia in Messina. He claimed that by the intervention of an angel he had written a voluminous work, ("Wonders of Wisdom"), and a commentary upon it. Abraham came to the community of Avila, Spain, with a forged letter from David Ashkenazi, calling first upon Solomon ben Adret. In perplexity the community turned to Adret, the greatest rabbinical authority of that day, for advice as to the attitude to be maintained toward the new prophet. Adret, without directly condemning him, expressed strong doubts as to his prophetic gifts. Prophecy, he said, did not rest upon an ignorant man, nor was it a time for prophetic inspiration; furthermore, the prophetic gift was given by God in Palestine exclusively. For these reasons Adret urged care and further investigation into the reputed miracles. The community took him at his word, and awaited with curiosity the last day of the fourth month of the year 1295—the day on which the Messianic time was to begin. The people assembled in the synagogue in the white burial garments used on the Day of Atonement; and the story goes that on these garments small crosses appeared. Such an impression was made upon Abner of Burgos by this "miracle," that it helped toward his conversion about twenty-five years later. Solomon ben Adret, Responsa, No. 548, which has been wrongly taken by Landauer and Jellinek to refer to Abulafia (Steinschneider, Jew. Lit. p. 308, § 47). From the responsum in question it is impossible to tell whether the name of the false prophet was Nissim ben Abraham, as Perles (Salomo ben Adereth, p. 5) supposes, or whether Nissim was the bearer of a letter to Adret on the subject, as Kaufmann, in Rev. Ét. Juives, xxxvi. 288, thinks.